It's rare in this world to instantly connect with people over the written word but that is what happened when The Wedding Pink selection committee read Laurie and Jessie's story. We are thrilled to welcome these special people into our Pink Family. When we got engaged in October 2015, we started discussing what our ideal wedding would look like. However, those discussions didn’t last very long because less than two months later, I was staring at a Stage III breast cancer diagnosis. As with so many other things on our agenda, the wedding was put on a back burner so I could focus on getting through my treatment. Near the end of my active treatment, a friend sent me a link to The Wedding Pink. 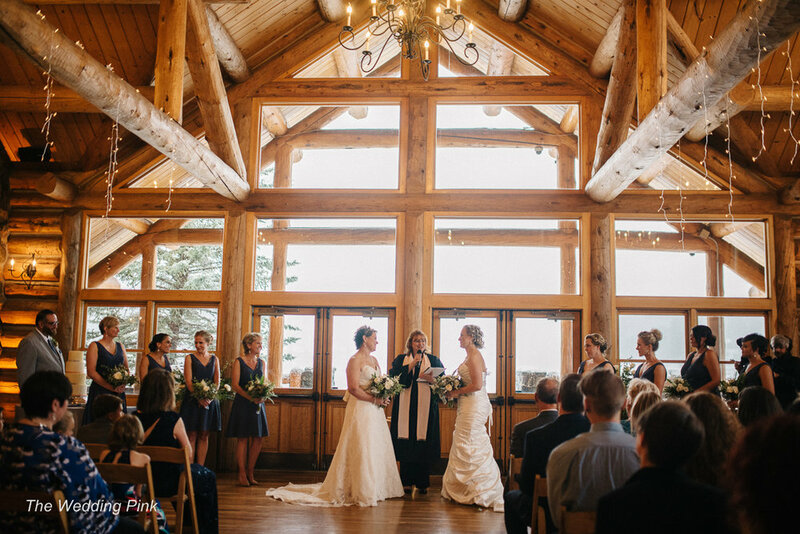 I read everything that I possibly could on the website, and I immediately fell in love with the idea of a beautiful Colorado wedding. I got to work on my application, hit the Submit button, and crossed my fingers. A couple days later I received a call from Melissa. Instantly we connected, and I knew right then that even if I didn’t win, I wanted to somehow stay in contact with her and The Wedding Pink. The next call with Cheryl and the larger committee solidified that thought. All I kept saying over and over is that I wanted to somehow remain connected to this amazing organization and the wonderful people involved. When the committee asked me why I should be chosen over someone else, I said, and still honestly believe, that I am no more deserving than so many others out there who have gone through this breast cancer experience. Every single one of us was deserving of a silver lining. For me, however, this was about so much more than me. I wanted to give Jessie, my fiancee, my caregiver, my co-parent, and my everything something beautiful after everything she had gone through with me. We cried tears of joy when we found out we were chosen as the 2017 Wedding Pink couple. Our excitement only grew once we flew out to Colorado for our initial meeting with The Wedding Pink organization and our wonderful team of vendors! Everyone was SO kind and generous with their time and their services. We were floored at just how incredible this experience was shaping up to be! As we were boarding our plane to go back to Cleveland, Cheryl told us that the next few months were going to fly by quickly. She was right! Before we knew it, we were back out in Colorado with our friends and family preparing for the big day! The big day….er….the big SNOWY day, is a more appropriate way to describe our wedding day! Even though it was the end of May, we awoke to a very large amount of snow on the morning of our wedding. Thankfully, we’re from Cleveland, and, as Elsa says, “the cold never bothered me anyway.” Even though it was a wee bit chilly, the snow made for absolutely gorgeous wedding photos. One friend even described it as “nature’s confetti,” and I think that’s an absolutely perfect way to look at it. The Evergreen Lake House was set up in a stunning show of raindrop lights and gorgeous table settings. Our wonderful wedding planner, Ann, even added a special surprise to our napkin holders by adding lyrics from Hamilton, our favorite musical. That was such a sweet thing for her to do, and I found myself teary-eyed from the gesture. The music, the food, the cake, the DJ, the flowers, and the officiant were all perfect. Everything was even more magical than either of us could have imagined. We visited with friends who had flown in from Ohio, Kentucky, and several other states, shared toasts, and danced the night away. Our children were able to participate in the wedding ceremony and also enjoy the photo booth and the bar of candy (which was Finnegan’s favorite part of the entire wedding!). The Wedding Pink exceeded our wildest dreams, and we are eternally grateful for all who donated their time and services to making the day magical. Of course none of this would be possible without Cheryl and her kindness toward fellow breast cancer survivors. Ann is the most amazing wedding planner, and I don’t know how we could have done all of this without her guidance. Jessie and I have so much gratitude for Cheryl, Ann, and all of the other wonderful people who helped make this day beautiful.